We always had a good time with those. These belong to girls, not boys. Girls dressed their wooden dolls and made houses for them. Estelle Oozevaseuk remembers tiny seal oil lamps that she made out of bottle caps for the dolls to use. Two of the figures are women, with pointed heads that show the hoods of their parkas. Estelle Oozevaseuk: Qawawaaq [carved ivory human figurine]. Those are toys. Branson Tungiyan: These don’t even have faces. They used to use these little ivory dolls for toys. They pretty much used them out on the beach or somewhere outside. They use these little pebbles to make a house, and then they used them pretty much as toys. Estelle Oozevaseuk: We never called this taghnughhaghwaaq [doll]. (1) The small ones are qawawaaq, an inside house play thing. The small ones would be lost when they used them outside. I used to have lots. We always had a good time with those. These belong to girls, not boys. Suzi Jones: Did you dress them up or just play with them this way? Estelle Oozevaseuk: Just played. Only the bigger ones are dolls. We’d dress them up. Suzi Jones: Did they ever have legs or were they usually shaped like that? 1. According to St. Lawrence Island Yupik Elder Vera Kaneshiro, this type of small figure is a qawawaaq [carved ivory human figurine], which is smaller than a taghnughhaghwaaq [doll]. A taghnughhaghwaaq was made from wood or bone. 3. According to Vera Kaneshiro, an alingtiiritaq [amulet/good luck charm/household guardian], as a household guardian, was usually made from wood and was larger than a taghnughhaghwaaq. An alingtiiritaq was placed at the entrance of a home for protection against bad spirits and to scare away enemies. See E063244. An agha [amulet/medicine/aspirin] included animal figures and was used to bring good luck, to protect against harm and for healing. 4. According to Vera Kaneshiro, the top of the head on two figures (right side of image) is shaped like the nasaq [hood] of a woman’s winter gut parka. Wood and walrus ivory dolls from St. Lawrence Island resemble those from other regions of the Bering Sea. 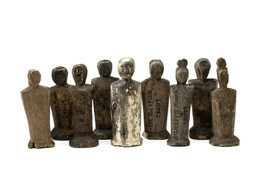 Most have only a head and torso, without limbs. (2) Girls often dressed their dolls in miniature skin clothing.